Directed by Yorgos Lanthimos and written by Deborah Davis and Tony McNamara, The Favourite is the story of two cousins who compete against one another to become the favorite and counsel for Queen Anne during the early 18th Century. The film is a study of two women trying to be the closest confidant to Queen Anne who is suffering from depression as she is also coping with events in her palace unaware of what is happening in England. Starring Olivia Colman, Rachel Weisz, Emma Stone, Joe Alwyn, Mark Gatiss, James Smith, and Nicholas Hoult. The Favourite is a rapturous and outrageous film from Yorgos Lanthimos. Set in the early 18th Century during the War of the Spanish Succession in 1701 to 1714, the film follows the life of Queen Anne of England (Olivia Colman) who is dealing with depression and various issues in and out of her palace as she is suddenly pulled in an emotional tug of war in who can be her closest confidant between two cousins. It’s a film that plays into a woman who is leading a country but is incapable of running things where her adviser and lover Sarah Churchill (Rachel Weisz) would be the queen’s spokeswoman. Along the way, she would take in her impoverished cousin Abigail (Emma Stone) who is given a job to work at the palace and later be Sarah’s assistant only to gain favor from the queen. The film’s screenplay by Deborah Davis and Tony McNamara does take some dramatic liberties with some of the personal events in Queen Anne’s life in favor of some of the legendary rumors about her. Yet, they do maintain this air of disconnect of the queen as it relates to what is happening in her country. Notably as there’s a conflict within Parliament as Tory party member Robert Harley (Nicholas Hoult) is against the queen’s idea of doubling property taxes to further fund the war as it was suggested by Sarah and Sidney Godolphin (James Smith). Harley would use Abigail to try and influence the queen as she would become attracted towards a young baron in Samuel Masham (Joe Alwyn) only for Abigail to do small things to win the queen over leading to problems with Sarah. The script doesn’t just play into this tension of favoritism between these two women but it also this dialogue that is biting and also crass in its delivery. Especially in the usage of profanity in how they refer to certain characters in the film as it would intensify during the course of the film as the rivalry between Sarah and Abigail over the queen’s affections become more dangerous. Yorgos Lanthimos’ direction definitely has an element of style in not just its compositions but the overall presentation of the film. Shot mainly on location at the Hatfield House in Hertfordshire in Britain, the film does play into this period of turmoil with the queen trying to distract herself with food, 17 bunny rabbits, and all sorts of things but it’s not enough as she’s constantly crying over pain in her body and other things. While there are some wide shots in the film, Lanthimos would use fish-eye lenses to get coverage of some of the locations including Parliament, the kitchen, and other things as a way to not rely on tracking shots or hand-held cameras with the exception of a few moments with the usage of dolly to follow a character. Still, Lanthimos maintains an intimacy into his direction in the way he would show these three women interacting with one another as well as put them in a shot at a certain position for some unique compositions and framing. Lanthimos’ usage of close-ups play into some of the reaction of the characters including Sarah and Abigail in their game of one-upmanship that intensifies as the story progresses. With Sarah being a master and a woman of control, Abigail would slowly learn how to scheme as it would play into her development of someone who was an innocent and impoverished woman with a knowledge of herbs and other small things into someone who gets loss through the usage of power. Lanthimos uses this idea of power-play as two women trying to win over the queen’s favor where Abigail is a woman that is constantly thinking of the bigger picture for England as she has to deal with someone like Harley who has his own ideas that Abigail believes would hurt the country and make Queen Anne look bad in front of the world. Lanthimos would up the ante during the film’s third act where it is about the reversal of fortunes for Sarah and Abigail with the two both enduring a change in favoritism. Yet, it would also reveal some harsh realities for both women as it relates to the queen. 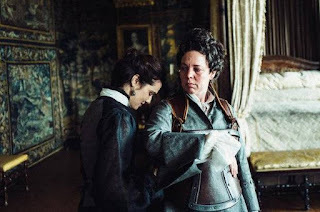 Lanthimos’ direction would become less stylish and more eerie in its compositions with Queen Anne being roped in the middle and becoming disconnected with what is happening with her country. It also play into the idea of human nature and what some will do to maintain a certain position in the palace but also think about the fact that Queen Anne is a woman that has to make the final decisions for her country and these decisions would have an impact on the country. 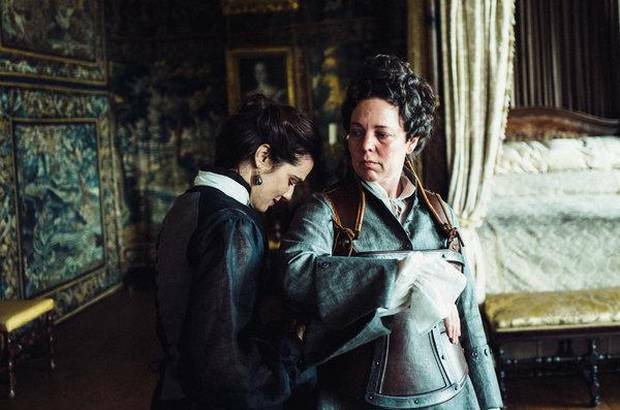 Overall, Lanthimos crafts an intoxicating yet darkly comical film about two women of the court trying to become the favorite for Queen Anne. Cinematographer Robbie Ryan does incredible work with the film’s cinematography in its usage of candlelight and natural lighting for many of the film’s nighttime interior scenes as well as providing some naturalistic colors for some of the film’s daytime interior/exterior scenes. Editor Yorgos Mavropsaridis does amazing work with the film’s editing with its stylish usage of dissolves and superimposed images as well as some jump-cuts and rhythmic cuts to play into the drama and humor. Production designer Fiona Crombie, with set decorator Alice Felton and supervising art director Lynne Huitson, does excellent work with the look of the many interiors of the house including the queen’s bedroom, the main hall, and the room where Parliament meets. Costume designer Sandy Powell does brilliant work with the costumes in the design of the dresses that the women wear including some of the lavish ones Queen Anne wears as well as some of the clothes that the men wear. Hair/makeup designer Nadia Stacey does fantastic work with the look of the wigs the men wore including the makeup that is sported by both men and women in parties as well as the look of the queen. Special effects supervisor Bob Thorne and visual effects supervisor Ed Bruce do terrific work with some of the film’s minimal visual effects as it relates to scenes of Abigail and Sarah shooting birds in the sky. Sound designer Johnnie Burn does superb work with the sound in maintaining an atmosphere in the locations and the way sounds are heard from another room and other elements that help play into the drama while Burn also provide some low-key ambient-like music pieces that pop up occasionally. Music supervisors Sarah Giles and Nick Payne do nice work with the film’s soundtrack as it mainly feature an array of classical and experimental music pieces from the likes of Johann Sebastian Bach, W.F. Bach, George Frideric Handel, Henry Purcell, Franz Schubert, Robert Schumann, Antonio Vivaldi, Olivier Messiaen, Luc Ferrari, Anna Meredith, and a contemporary piece by Elton John in the film’s final credits. The casting by Dixie Chassay is wonderful as it feature some notable small roles from Jenny Rainsford as a tavern owner in Mae, James Smith as the 1st Earl of Godolphin in Sidney Godolphin who is often on Sarah’s side of things relating to politics, and Mark Gatiss as Sarah’s husband in the 1st Duke of Marlborough in John Churchill who leads a regiment as he’s trying to help England win the war. Joe Alwyn is superb as 1st Baron Masham in Samuel Masham as a young baron who falls for Abigail though he’s hired by Harley to woo her as he is essentially a cuckold that is used by everyone. Nicholas Hoult is fantastic as the 1st Earl of Oxford and Earl Mortimer in Robert Harley as a political figure and landowner who is opposed to the ideas that Sarah is trying to have to fund the war as he is someone that wants the war to end as he’s slimy and full of devilish charm. Emma Stone is incredible as Abigail as a young woman who was once a lady and is forced to work as a servant where her knowledge of herbal medicine would help the ailing queen as she later becomes Sarah’s assistant and become a close confidant of the queen where she displays a dark demeanor who becomes enamored with the decadence of palace life. Rachel Weisz is phenomenal as the Duchess of Marlborough in Sarah Churchill who is the queen’s closest advisor and lover as she tries to handle the many things that queen needs to decide on as she is very protective of her while she becomes threatened by Abigail whom she’s forced to compete with as well as deal with the severity of Abigail’s own plotting. Finally, there’s Olivia Colman in a tremendous performance as Anne, Queen of Great Britain as a woman filled with self-doubt, grief, and insecurities that are key to her depression as someone that is needed and to be loved while trying to run a country unaware of what is really going on despite Sarah’s counseling where she turns to Abigail for comfort as she would unknowingly play into the chaos in her own palace as it’s a career-defining performance for Colman. The Favourite is a spectacular film from Yorgos Lanthimos that features great performances from Olivia Colman, Rachel Weisz, and Emma Stone. Along with its ensemble cast, its whimsical script, gorgeous look, intricate sound work, and its offbeat approach to music. It’s a period drama that doesn’t play by the rules while being a study of favoritism, grief, and power told in a strange love triangle between three women. In the end, The Favourite is a magnificent film from Yorgos Lanthimos. I felt really conflicted when I left the cinema after watching this, but the more I think about it the more I've come to realise that I enjoyed the hell out of it! I adored this movie and I can't wait to watch it again. I wish Olivia Colman would win that Oscar. @Allie Adkins-It is one of those films that makes you think yet it helps as I just enjoyed the hell out of it. @Brittani-I'm rooting for Olivia Colman all the way as she was just awesome. Glenn Close either just has to wait for the honorary Oscar or just give it up the chase and dream. Fantastic review. Was glad you enjoyed it. The trio of fine performances at the centre was a sight to behold. @vinnieh-Indeed. I had fun watching this film. I await to see what Yorgos does next as I will watch The Killing of a Sacred Deer later this year. Great review. Definitely one of the best of 2018. I wish this was more in the running for major Oscars, but I do appreciate that it landed so many nominations. @Alex-It's currently in my top 5 films of 2018 as I was impressed by it as well as be engaged by its politics and how women were running things behind the scenes in a world that was mainly dominated by men.